May you all be blessed with divine Grace! Best Wishes for a healthy, prosperous and safe New Year! What a year ~ Meera started preschool! 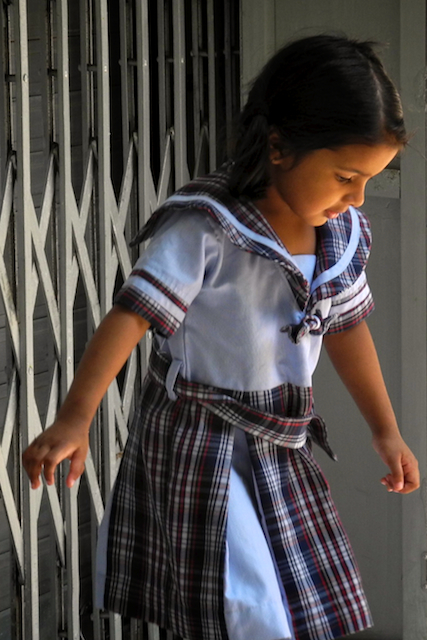 Seeing Meera in her übercute school uniform, brought a lump to my throat. She is growing sooo fast! Where is that cuddly baby? She still loves it when I call her Meera-baby and she asks to be cuddled. Always Meera. 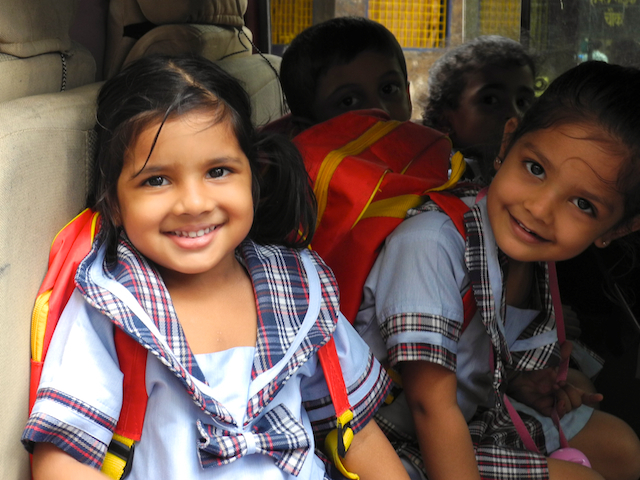 Pre-schools in Mumbai are very flexible and we enrolled Meera at three and half. She gets a nice uniform, a minivan picks her up from home and drops her off after two hours of instruction. This day, Meera was surprised to see me when the van door opened for her to get off. Wish I could be there every day. They teach reading and writing basic alphabets, simple words and numbers. While instruction is in English, Meera speaks to her class-mates in (Mumbai) Hindi, Konkani at home and occasional Marathi with the maids. When I was told she is failing in English, I congratulated M! See, at this young age I rather Meera learn and be fluent in Konkani, Hindi and Marathi. She has the rest of her life to master Angrezi. 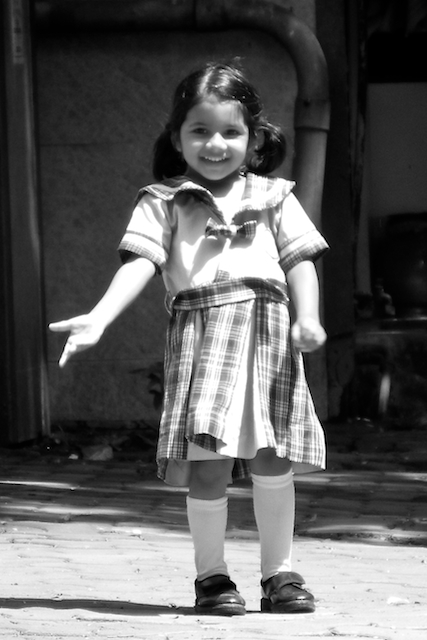 We observed early on that Meera loved dance and music, and she takes every opportunity to practice her moves. She just cannot stand still even to take a pic in her uniform – this is what I got! (She loves that pic frame we got from the GSB Seva Mandal Ganapati). Pre-school is demanding. Meera has about an hour of homework each evening. Even I didn’t do as much in college. They have tests and exams for a 3-yr old! When I was visiting, we took Meera to Goa, Kumta and Kochi; we got a call on our cell from her teacher wondering why Meera was not in school. She berated M for pulling Meera from school, as more tests and exams were coming up. Ugh! Such a cutie! Pls give her hugs and kisses on my behalf! My son just turned one and I’m not so regular with my online stuff anymore. God bless and I hope she joins u here soon! Cute boy – now that he is running around, must keep you busy. This is such a great age and glad you are deciding to spend time with the boy, rather than with crumpy co-workers. Have you posted pics anywhere? Am off to Mumbai in a few days, so yaay Meera! To see lil’M in pre-school already … truly time (flies) fast. I agree with you, let lil’M enjoy her days and learn what she wants. Englishi can come later and as everything esle, she will master that too , with the New England slang! mumbai chi progi with Boston accent? aaargh! Great photos of Meera in her preschool outfit! I always like to read about Indian food and culture on your blog which is why I nominated you for the Versatile Blogger Award! Keep it up! Best wishes to you and your family for a wonderful 2012! Thank you Preena for the nomination! You are doing an amazing job with your blog. Wishing you the best in the New Year and more success with your blog. When you feel like running in Boston, let me know. … and you mentioned MEERA in your blog-post! Yaay! Meera – cute as always! So they have such pretty uniforms now in India. So different from the blue and khakis that I would see in the 70’s and 80’s. It is so nice that you went on a vacation, despite Meera’s taxing school schedule. How I wish I was a fairy who would wipe away exams for little kids and make their learning enjoyable. I agree with the school uniforms; and these are so much more easier to wash to maintain. Notice, the entire thing is just one piece, so Meera is not losing the tie or belt for eg. Yaay! Super cute Meera baby….. U guys are blessed…. Thank you, and blessed indeed. Wishing you all a very happy new year 2012 … Meera is growing up to be so pretty and love her innocent looks… Good to see a write up on Meera after a long time!!! Wish to see more… Kids are sooo adorable!!! THank you Shilpa. Hope you guys are doing well. Heh, I will be in Mumbai in Feb and will see if we can meet with baby Subha! how quickly she has grown indeed! precious. wish you all a happy 2012! Thank you Smitha! Sorry, we never got a chance to meet in Mumbai. If you are still there, I may be back by the end of Jan and we should meet-up. M is really busy with Meera’s school and ALL her playdates. Divya is looking good! Can you please email me your Tf # in Mumbai? I am very happy to see that Meera has grown up like a princess. She is absolutely an adorable darling. You are doing the right thing to provide her the opportunity to learn the Indian languages at her young age. She will appreciate that when she grows up. Best wishes to you and yours a happy New Year. So great to hear from you. Is one of your kids here in Boston? I know we had talked about it. How are you doing? Next time in Boston, please let me know and we can catchup over coffee or lunch. Yes, Meera is such an amazing child (like all kids, I am sure), and has been picking things up in Mumbai like a sponge. One day you will meet her too. PS, I have to ask you something about India. A nice uniform, no? And its Wash ‘n wear, no ironing required. Yaay! Children grow up so fast na. Absolutely yes! Need to tell her to slow down ~ what’s the rush? She is indeed lovely Arun! Wishing you and yours a very Happy New Year indeed!! Nice hearing from you Pratibha; How are you guys doing? Are you coming for Satsang on Sat? actually, it is we who are lucky to be ensnared by her ~ what joy. Nice meeting you all last weekend.